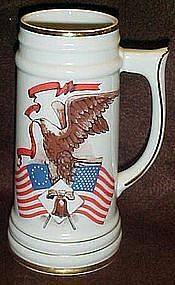 Nice porcelain beer stein with a patriotic motif. An American eagle, flags, and our liberty bell. On the back it reads 1776-1976 200 years of freedom. Made by Viletta, Roseburg Oregon, USA. Made of nice porcelain with gold trrims. Measures 7 1/2" tall and is in pristine condition.